During the Cascoland festival in the township New Crossroads six interviews were being broadcasted. The theme of each interview was: Where is Home? Where do you feel at home? What does your house look like? Why do you live in Cape Town? What’s the difference between living in Africa and Europe? 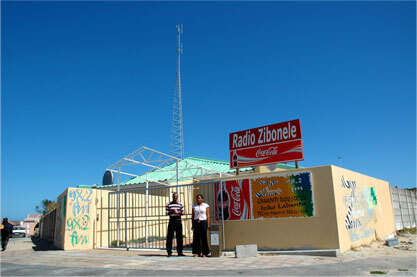 The interviews are broadcasted by Radio Zibonele, a local radiostation with a range of 300.000 people living in the different townships of Cape Town. Owns a cafe in Cape Town and lives in one room on the roof of the cafe. Lived all her life in Old and New Crossroads, she rents one brick house for her entire family. Moved to Oeganda in 2001. Lives by himself in a small house in Kampala and works as a journalist. He has the dutch nationality. Lives temporarily in a room at her brothers house in Cape Town. Moves regularly. Works as an actrice and as a waitress. Lives in New Crossroads. Poet & Songwriter. He dedicates his time improving the quality of life for all in New Crossroads. He made a special poem about the theme: Where is Home? Is politicly active in Crossroads since 1974. Lives in a house in Capetown and has a second house near the sea outside the city.